For this client, cardiology was an area with lower awareness and reputation nationwide. As a top-ten ranked hospital in the U.S., this was an opportunity to improve reputation and referrals by increasing awareness of its innovative heart institute. Finding an affordable way to reach a small target audience that spends little time with traditional and non-traditional media was a challenge. 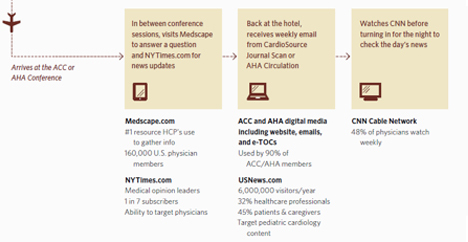 Using research tools, we uncovered how cardiologists and subspecialists use media and then create a communications roadmap of online and print media to increase awareness and reputation. Online exceeded campaign goals and delivered the strongest results—1, 094 clicks in the first six months versus a goal of 600. The online campaign also generated 401 downloads of video and team listings. Cardiologists and subspecialists filled out 5 forms and made 3 phone calls to learn more about the hospital’s heart institute. Post-campaign research conducted by the hospital showed its heart institute’s awareness increased from 30% to 67% and that ad recall significantly improved the likelihood to refer patients.